Jeff Chambers submitted this photo and caption. I took this photo at the 2009 Drums Along the Columbia Show in Pasco, Wash. Santa Clara Vanguard was the first group to perform following the intermission so during the intermission I went back to the parking lot area where the warm ups were taking place and took a few pictures of my favorite drum corps, Santa Clara Vanguard. 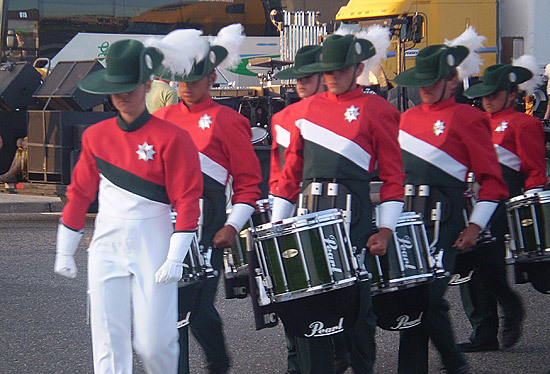 This is a picture of the battery percussion section as they were moving to the gate before their performance. The evening was full of great performances but SCV was definitely the crowd favorite as they brought the entire crowd to their feet with their show "Ballet for Martha."